^ Stave, Erik (2002) [1901–1906]. "Æshma (Asmodeus, Ashmedai)". In Singer, Isidore; Adler, Cyrus; et al. (eds.). Jewish Encyclopedia. New York: Funk & Wagnalls. LCCN 16-014703. Retrieved 7 March 2018. since it is paralleled by the later Pahlavi-form "Khashm-dev" ("Khashm dev" = "Æshma dev"), written with the Aramaic "sheda," but pronounced "dev." 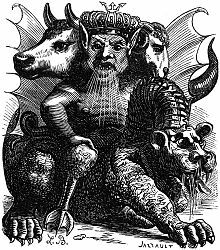 [..] Asmodeus (Ashmedai) embodies an expression of the influence that the Persian religion or Persian popular beliefs have exercised on the Jewish—an influence that shows itself very prominently in the domain of demonology. ^ Bane, Theresa (Jan 9, 2012). McFarland (ed.). Encyclopedia of Demons in World Religions and Cultures. p. 191. ISBN 978-0-786-46360-2.